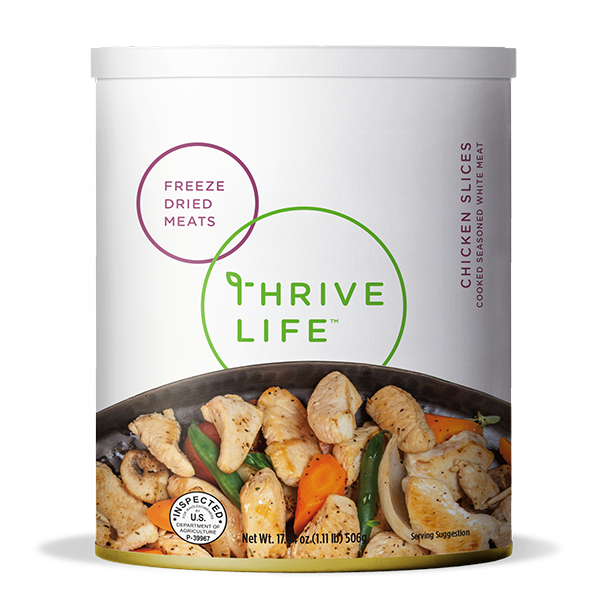 Thrive Sliced Chicken is made from strips of whole chicken breasts that have been freeze-dried to lock in the fresh taste and nutrients for years to come. Each carefully sealed can of Thrive Sliced Chicken will last for up to twenty-five so it is ideal for both daily use and long-term storage. Thrive Sliced Chicken is cut into strips that are just the right size for using in fajitas, salads, pasta, and all your other favorite recipes. Each bite contains beneficial nutrients such as protein, iron, and fiber. With Thrive Sliced Chicken you will be able to fix creative, delicious, and healthy meals all without the hassle and mess of raw chicken. Add 1/3 cup warm water to 1 cup Seasoned Chicken Slices; cover and let sit about 15 minutes. These slices are bigger cuts than the Chopped Chicken, and are lightly seasoned so they're ready to go right into pastas, quesadillas, pot pies, and more. Throw some in a Ziploc bag with your favorite THRIVE veggies and you'll have an instant stir-fry ready for a quick weeknight meal - just season, cook, and serve over rice.